A variety of decisions must be made during an evaluation including: what the focus of the evaluation will be; who will undertake the evaluation; how data will be collected and analysed; how the evaluation will be reported; and who will have access to the final report. Therefore, it is important to establish a decision making process to ensure agreement can be reached on how decisions will be made. A variety of groups may be established within the governance structure in order to advise on the evaluation. 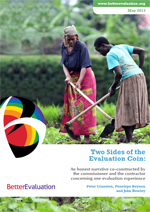 Evaluation decisions are often made by a steering committee, with representatives from different stakeholder groups. An expert or technical reference group or an advisor with specific expertise might provide targeted advice. A diverse range of stakeholders with different perspectives might also be consulted about the scope of the evaluation or on specific issues such as the accuracy of the program logic or the interpretation of findings. Control may be centralized in a specific manager or committee or it may be shared by a working party involving representatives from many different stakeholders. Advisory group: forming a group to provide advice on evaluations without making any actual decisions. Citizen Juries: using representatives from the wider community to make decisions about possible approaches or options. Steering group: establishing a group to make decisions about an evaluation. Round robin: a structured process for generating ideas in a group. Six Hats Thinking: promoting holistic and lateral thinking in decision-making and evaluation by using different roles. Consensus decision making: decision making processes that aims to find decisions which everyone can accept. 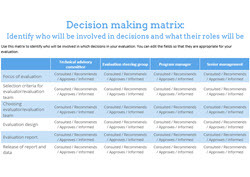 Majority decision making: basing decisions which have the support of the majority of the decision makers.